With the Mac clean and functional, it was time to install a few upgrades. The reason I wanted a FW400 model was native Mac OS 9 compatibility but I really wanted FW800. So a 64-bit (bootable) card was found and installed. Even though I will probably never need it, I also wanted USB 2.0 available just in case so this was installed through a PCI card as well. 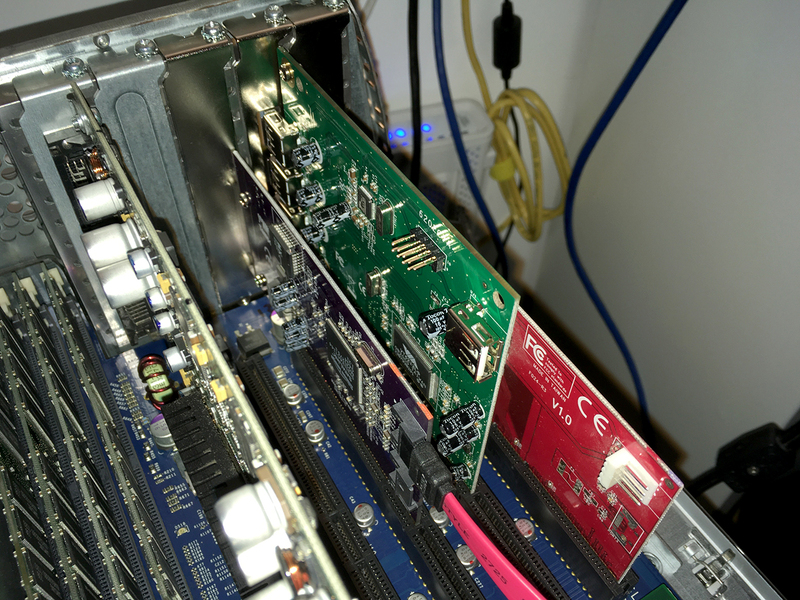 A SATA PCI card was of course also required to run an SSD in this Mac. The USB 2.0 card had to be flashed to be compatible with Mac, this was very easy to do. 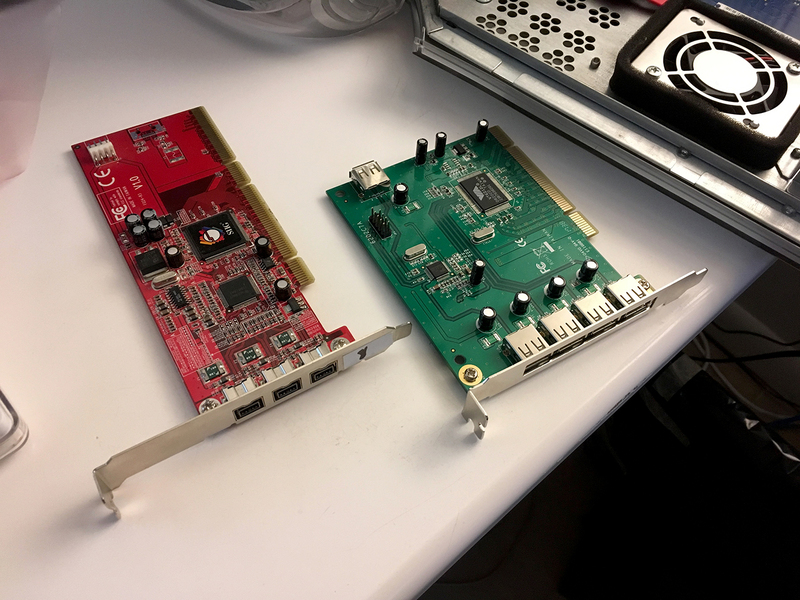 Basically you need a PCI USB 2.0 card with a specific Silicon Image chipset, even if it’s Windows only, and you can flash the BIOS to make it Mac compatible. I will add links to these instructions when I find them again. Sonnet is of course plug and play and the FW800 card works flawless as well. Next it was time to make this beast run a little cooler and quieter. Not an easy task as the CPU’s run very hot. The extremely loud fans Apple put in these Macs were unfortunately necessary to keep it running cool enough. First step; see if the previous owner ever ran the firmware update that Apple released to adjust default fan behavior. This made a big impact when running Mac OS X but still saw the fan running at near-constant full speeds in mac OS 9. System profiler showed the firmware as “4.4.7f1”, this meant the latest firmware was not installed. After running the updater (documentation & download), the firmware is now “4.4.8f2” and the main fan runs considerably quieter. Unfortunately 90% of the noise comes from the power supply fans. These have been notoriously difficult find replacement fans for that push enough air and are quiet enough. Additionally my power supply is a 400W AC/Bel which are by far the loudest models. I’ll have to get my hands on a 360W power supply at some point and start testing replacement fans in that. After an overwhelming protest from their customers back in the day, Apple recognized these Macs ran way too loud and upgrade kits were made available. These consisted of a quieter main fan and a Samsung or AC/Bel 360W power supply also with different fans. This helped but they were still loud. I attempted to replace the main fan with a few alternatives but none of them were strong enough to bridge the 8-inch gap where fresh air needs to be sucked in, funnel it through the hard drive cage, then the heatsink and out the back of the enclosure. 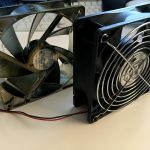 The Delta fan can barely get it done so finding an alternative that performs better and runs quieter has been a challenge. Eventually I ended up with two fans to replace the Delta fan. 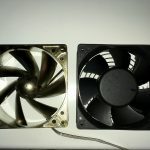 These are SilenX IXP-76-18 iXtrema Pro 120x38mm fans and one is mounted directly on top of the heatsink. Rated at 18dB and 90CFM the result is an overall much more silent experience (comparing this with just the Delta, the power supply fans still drown everything else out). The much larger blade surface makes a big difference as well. The heatsink mounted fan really helps the overall heatsink temperature but particularly the top portion. This fan setup has kept the CPU’s pretty cool. 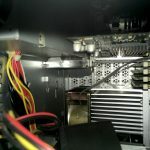 Under prolonged maximum load (hosting an Unreal Tournament Server) I had to crack the case open and apply an external fan though, even when it was just the Delta or a Delta with SilenX on the heatsink, the CPU’s would just not stay cool enough (65+C). New thermal paste made very little difference. 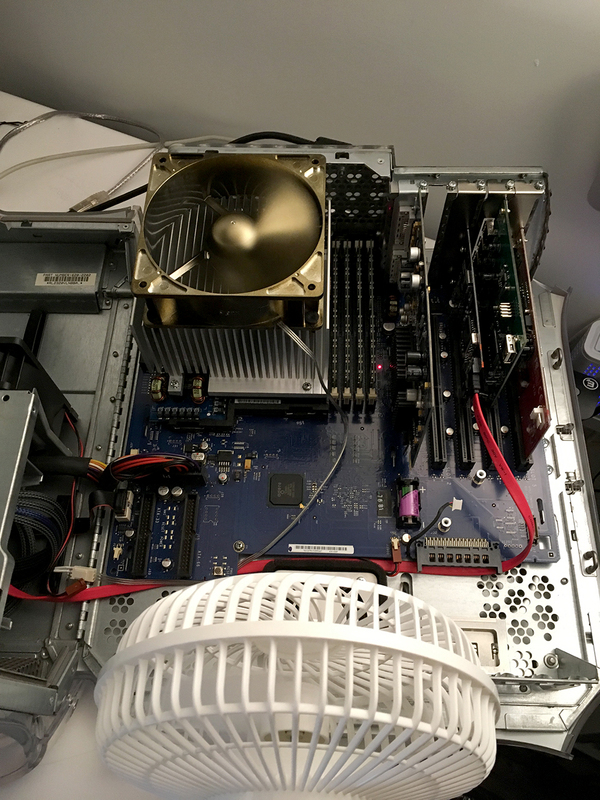 With the case open and an external fan the CPU’s held steady at 40-45C easily. The RAM and CPU (which receive no airflow at all with the case closed) were also very happy with this setup. Alas I started experiencing glitches and weird behavior and one night during a pretty intense Unreal Tournament game the whole thing just fells apart. Freezing, weird noises, the works. 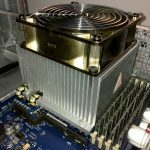 Even with the external cooling the heatsink burned my fingers when I touched it so it was running well over 80C at least. With the case clogged up with dust used probably for many years running way too hot, the CPU’s were probably already damaged before they ended up in my office. 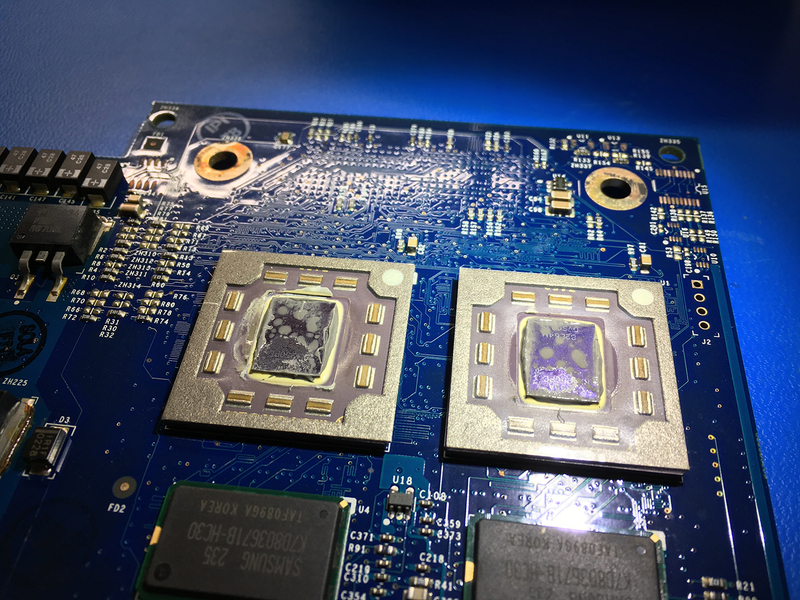 When I removed the heatsink the Arctic Silver thermal paste had pretty much evaporated on one half of the CPU’s and had to be chiseled off from the other half of the CPU’s. There is no way these things should not have triggered an instant shut-down but I believe the temperatur sensor was busted and not reporting the right temperatures to trigger such an event. And so Project Maya came to a halt, for now. Time to look for a new processor.